Lineage. 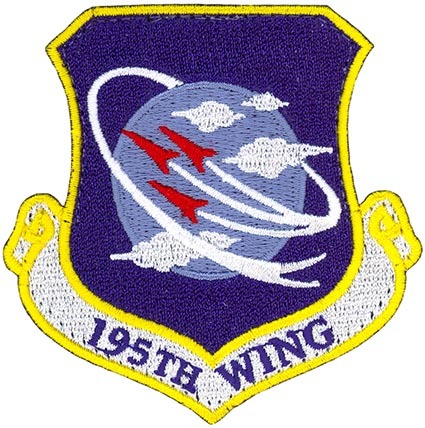 Constituted as 195th Wing and activated on 7 Nov 2015-. Components. Groups. 195 Intelligence, Surveillance and Reconnaissance, 7 Nov 2015-; 195 Operations, 7 Nov 2015-. Squadrons. 222 Intelligence Support, 7 Nov 2015-; 234 Intelligence, 7 Nov 2015-. Stations. Beale AFB, CA, 7 Nov 2015-. Operations. Serves as the hub for all non-flying, non-kinetic global effects operations in the CA ANG, leading the way in cyber, intelligence and space mission areas. Provides expeditionary communications and network warfare services in both a federal and state capacity. With active-duty USAF partners, operates the MILSTAR satellite constellation and provides Space Control capabilities at Vandenberg AFB. Provides network defense out of Van Nuys ANGS. Provides combat communications and unclassified satellite imagery from its sophisticated Eagle Vision III system in San Diego. Provides intelligence capability and support to the Active Duty USAF for the 548 ISR Group at Distributed Ground Station-2.